Flairbuilder.com to build applications online | Tech for Lunch! Flairbuilder.com is one of those web-based applications that make you wonder why people create just about anything online. It is actually a pretty neat idea, but I’m not too sure about its real-life applications, aside from the proof that it can be done. Flairbuilder is basically a web-based application that you can use to create web-based applications. It is built on Adobe Flex and lets you create a Flex application directly online. The UI is somewhat a re-creation of Flex Builder, and will let you switch between Building and Coding just like the real thing. Here is a screenshot of a quick application I made… I made this one after I created a better one but accidentally closed the window, so it’s really simple. Thanks a lot for the review! I’ve been working for a while on this project, and feedback and criticism are most welcomed. I totally agree that the application is in a “work in progress” stage. I am focusing a lot right now on usability. 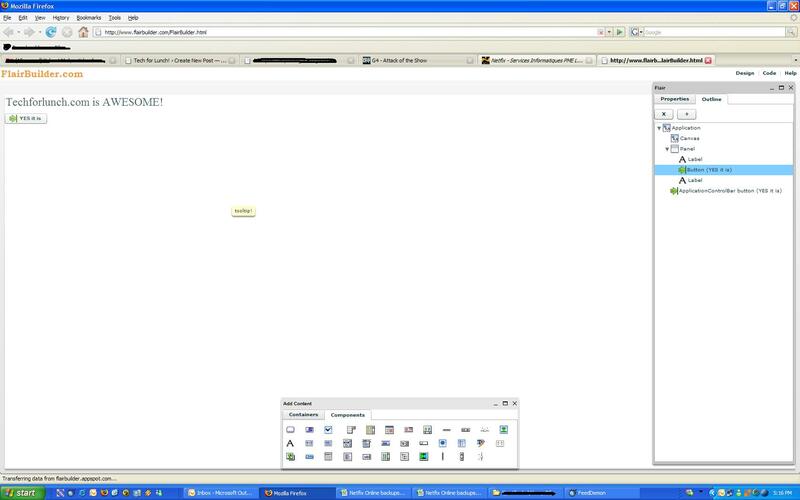 Also, the site on flairbuilder.com is quite dump as you noticed when loosing the work by closing the browser window. As for the real world usage of FlairBuilder, I can only say that I am actually using it for building parts of it. 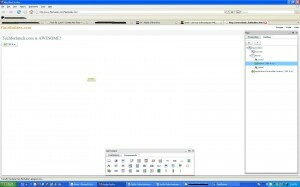 For example, the icon browser was started in FlairBuilder. Currently is targeted for quick mockups, and, indeed, requires knowledge of Flex without requiring FlexBuilder and Flex SDK. I also use it for other applications I am working on. I think that in time, given precious community feedback, its real usefullness with become more obvious. And once I get a first usable version released I hope I’ll be able to focus on some more advanced features that I had in mind since starting this project. Thanks again for your valuable feedback! Thanks for the comment Cristian. It’s always nice to see that some people are looking at what is being said about their products. I will certainly be taking another look at your work in the future and feel free to let me (and TFL readers) know about the evolution of your work. I certainly hope the community around your project will grow because the potential is there. Hey! FlairBuilder got a whole new look and purpose meanwhile. Perhaps you’d like to check it out again.